A little while ago, I followed a retweeted link to a blog post by writer Sofia Samatar, presenting the syllabus for a class on weird world fiction she’ll be teaching this semester. It was an interesting list. Some names were new to me, so I set about looking them up. 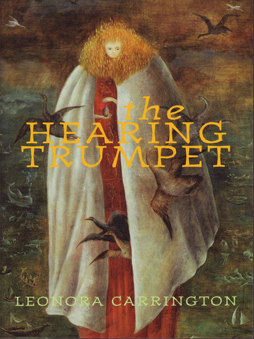 And found a library near me had a book by one of these writers: The Hearing Trumpet by Leonora Carrington. Which turned out to be a constantly surprising read, a short book that opened doors to places I didn’t expect. 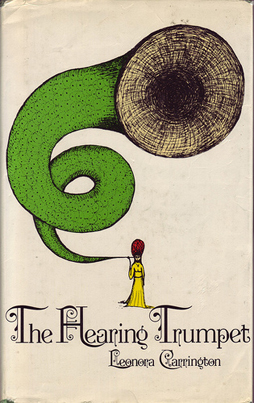 The Hearing Trumpet may have been first written in 1950, or perhaps in the early 1960s; it was first published in French in 1974, then in Engish in 1976. 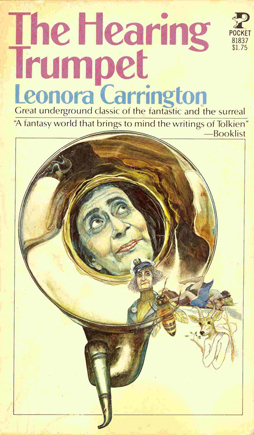 It’s a story about a 92-year-old woman, Marian Leatherby, given a hearing trumpet by her friend Carmella (a character widely believed to be based on Carrington’s close friend, the surrealist painter Remedios Vero — see more of her work here). The trumpet sharpens Marian’s hearing to a fantastic degree and she at once hears her family planning to put her in a home for old women. This institution turns out to be marked by strange architecture — buildings in the shape of “toadstools, swiss chalets, railway carriages, one or two ordinary bungalows, something shaped like a boot, [and] another like what I took to be an outsize Egyptian mummy,” with the main building a castle at the centre — and is run by highly idiosyncratic Christians. A picture of a one-eyed female saint seems to grin mockingly in the dining hall. Strange things follow: one of the other inmates dies, perhaps murdered; Marian is given a peculiar book outlining the history of the painted saint and her quest for the Holy Grail; and then things get much, much weirder. The book didn’t attract much attention when it was published, but its reputation has grown in recent years. Penguin published a nice edition in 2005 with an introduction by Ali Smith, who not only makes some intelligent observations about the novel, but also gleefully tells tales of Carrington’s own wild life. You do get the sense, reading the book, of an unconventional mind at work. But also of a keen one, and a broad one. As the novel moves briskly along, it swerves wildly among increasingly wide-ranging symbols. Christian esoterica becomes more prominent, along with pagan imagery. 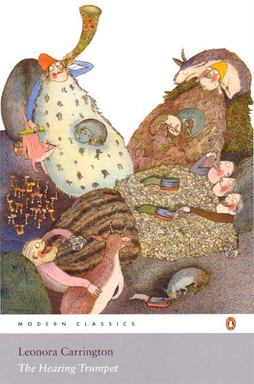 It has been convincingly argued that the book, while undermining Surrealist myths of the femme enfant — a young muselike figure, often irrational or even mad, but able to directly access her own unconscious and who therefore can connect the male artist with his own creativity — also presents a female-centred rewriting of the Grail quest, incorporating Jungian and alchemical symbolism. And all this begins with the gift of a hearing trumpet. The story grows as it goes on. The spiralling effect of the book is one of its most wonderous aspects: it may start with an old woman and a slightly-unusual hearing aid, but the trumpet seems to open a gateway into something beyond madness — in fact, into miracle. Marian refers to the trumpet early on as “the fatal hearing trumpet,” and we will see that in a way it is indeed fatal to her; not wholly fatal, but fatal in a deeply transformative way. Time, as we all know, passes. Whether it returns in quite the same way is doubtful. A friend of mine who I did not mention up till now because of his absence told me that a pink and a blue universe cross each other in particles like two swarms of bees and when a pair of different coloured bees hit each other miracles happen. All this has something to do with time although I doubt if I could explain it coherently. This particular friend, Mr. Marlborough, has been living in Venice with his sister so I haven’t seen him for some time. Mr. Marlborough is a great poet and has achieved fame in recent years. At times I had thought of writing poetry myself but getting words to rhyme with each other is difficult, like trying to drive a heard of turkeys and kangaroos down a crowded thoroughfare and keep them neatly together without looking in shop windows. There are so many words, and they all mean something. Marlborough tells me his sister has been a cripple from birth although he says it so mysteriously I sometimes wonder what is really the matter with her. Marian’s leaping from subject to subject is somehow less distracting than it ought to be; there’s a kind of hidden order to her thoughts. So Carrington’s able to throw out pointed side-comments and it feels like a part of the natural flow of Marian’s voice: so many words and they all mean something. As the book goes on and Marian goes through changes that appear to be more than merely natural, this dreamy language deepens and becomes something truly visionary. Surrealism as a movement was fascinated with dreams, attempting to undermine the rationality of the ‘real world’ by using dream-imagery to create a sense of the more-than-real. That seems to be Carrington’s basic approach in The Hearing Trumpet, but there’s a good deal of conscious structure in the book as well. The seeming illogicalities and improbabilities of the book resolve by the end, turning out to be elements in a much bigger story than we could imagine. The climax, in fact, is literally apocalyptic. The world’s turned upside-down. And Marian faces her own personal apocalypse as well. But this isn’t simply about destruction; this is a true apocalypse, in which the old is wiped away and made new. The book uses Christian imagery, but also reimagines it with new colouring, pagan and feminine: Carrington uses the mythic story of a suppressed matriarchal paganism as a way to rework the apocalypse. This could have been dire, programmatic, but Carrington’s lightness of touch keeps the novel moving. Everything hinges on an extended text-inside-the-text at the centre of the book, the tale of the winking saint whose portrait hangs in the institution’s dining hall. It seems to change the whole nature of the novel, revealing bigger truths then we might have realised were at play. It also seems to be a concentrated version of much of the imagery of the novel, bringing out themes of androgyny and the blurring of genders: the book’s full of bearded ladies and somehow it’s not entirely surprising to find that the most ladylike of the old ladies is no lady at all. It seems in fact to be inevitable: gender as something constructed, femininity as an imagining (a surreal imagining) of men. I’ve mentioned before that many novels by visual artists feature highly detailed descriptions and textures: worked surfaces. The Hearing Trumpet has a number of striking images and certainly those images are important to the structure of the book, but it contains few extended descriptions. Carrington instead gets at a dreamlike feel by not describing things, by simply stating what’s what and not trying to make them feel concrete. It’s a marvellously effective technique, allowing the images to live in the reader’s mind, while also letting the book move quickly. There is a real visual imagination at work in the strange objects and settings Carrington presents and the many strange metamorphoses objects and people undergo. But it’s never laboured, never sluggish. Ultimately, The Hearing Trumpet manages the rare trick of being both profound and warm. It’s both funny and visionary, a rare trick (for what it’s worth, I found myself oddly reminded of the Genesis album Foxtrot, with its songs about old people and long-ago knights and astronomical observations all overshadowed by the apocalyptic imagery of the sidelong track “Supper’s Ready”). It’s surrealist and fantastical: it says profound things about the world and human character through the use of inspired imagery. And it is consistently unpredictable, always becoming something other than what you expect. It’s an excellent book and an excellent story. You had me at Ernst and Varo…and it just kept getting better. It’s not often that I hear about a book that makes me nostalgic for academia, but Carrington sounds like she’d be fun to think about in all those modes. I’ll definitely check her out. It looks like Samatar’s syllabus comes mainly from Vandermeers’ The Weird anthology, which I recently bought. It’s clear that the Vandermeers (as well as Samatar) are making the case that weird fiction should be understood more widely than just the usual suspects from pulp days of the 20s and 30s. I’m excited to read weird fiction from any culture or any time period. This post had made me move The Weird up toward the top of my “to read” pile. My god, this book sounds fantastic! I’m hunting down a copy as soon as I post this comment. Thanks for the good words, everyone! Hope you find and like the book. James: Good point about the VanderMeers’ anthology. I totally agree, it’s exciting to broaden the definition of ‘weird fiction,’ and to realise that it’s something that can be found all over the place!